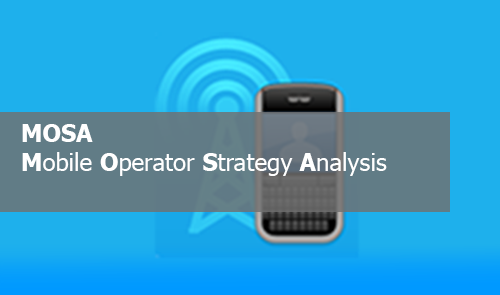 MOSA is an exclusive Mobile Operator Strategy Analysis Service. It is an exclusive online interactive Operator Tracking Service database and analysis profiling 4G operators worldwide. Key information includes: Operator Profiles, KPIs, Spectrum Strategies, Network Strategies, SWOT Analysis, Device Strategies, Leaders by area, Forecasts by Operator. MOSA is a unique source of comprehensive information for the entire 4G ecosystem. More than a database, it is an online resource for industry collaboration & development. The entire 4G ecosystem can benet from the information in MOSA. Clients include major operators, equipment vendors, device and component makers, investment institutions and regulators. SERVICE PROVIDERS: Accessing the best industry practices of other leading service providers worldwide. EQUIPMENT VENDORS: Capitalizing on the 4G opportunity and understanding market potential and trends, nding new sales leads. FINANCIERS: Uncovering investment opportunities in various regions and countries among service providers. MOSA analysis is based on hard data and produced following in-depth interviews with carriers, making the output highly reliable and timely. time is wasted in researching every operator to learn about their business and core issues..
ering and identify business opportunities faster. MOSA helps network operators locate compatible roaming partners. MOSA informs you of partnership announcements, new services, pricing changes, and customer uptake.